Formaldehyde is one of the most common indoor air pollutants, and is a known respiratory irritant and carcinogen (for more information on formaldehyde exposure see the wiki here). Meta- and paraformaldehyde are often used in industrial resins for materials like particleboard that are pervasive in many homes. Formaldehyde can offgas from these materials and be an airborne indoor toxicant. While formaldehyde is a known indoor contaminant, information is severely lacking on the concentrations of airborne formaldehyde people are exposed to in their homes. This experiment is part of the larger Where We Breathe project of Public Lab in which we have been working on a way to make formaldehyde testing affordable so that people can measure formaldehyde in their own homes, build information about common exposure levels, and collect further information about ways to mitigate formaldehyde exposure and resultant health effects. You can see all of the Public Lab research notes about formaldehyde here. We began by building a prototype lower-cost version (by @nshapiro) of the most inexpensive formaldehyde detection method we found in a peer-reviewed publication, which is also one that does not require sending samples to a lab for analysis (which perpetuates hidden expertise and increases opportunities for sample contamination). @mathew and the kits team then began developing two versions of the kit: one sturdy kit that is calibrated and built into a case for dropping in the mail and sharing across a variety of communities, and one DIY kit that is even less expensive than our original prototype by using a DIY bubble flow meter to calibrate airflow. All of our test kits involve have hacking an inexpensive aquarium pump to replace expensive industrial pumps that draw air through detection tubes, lowering the cost of a sampling assembly by ~$2000. There are inexpensive commercially available colorimetric formaldehyde detection tubes (Kitagawa 710 tubes, ~$7 per tube), that measure formaldehyde through a color-change reaction between formaldehyde and hydroxylamine phosphate in the tube. The manufacturer’s information sheet states the tubes are precise to 10%, though interestingly, it makes no claims of the tubes’ accuracy. Since the reaction inside the tubes with hydroxylamine is not selective for formaldehyde, other ketones and aldehydes will have a similar reaction. Acetone and acetaldehyde are potential co-contaminants that could thus interfere with the measurement of formaldehyde, causing erroneously high formaldehyde concentration readings. In order to assess the accuracy of our formaldehyde detection kit (including the modified aquarium pump and Kitagawa 710 tubes), we co-located our equipment with federally accepted equipment of the Department of Health in Rhode Island, which included 2,4-dinitrophenylhydrazine (DNPH) -coated silica gel cartridges and followed the EPA federal reference method TO-11A for sampling and analysis. 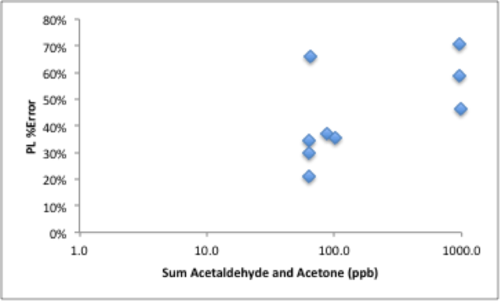 Analysis of the DNPH tubes by UV-HPLC provides quantitative data regarding the concentrations of formaldehyde, acetaldehyde, and acetone in the air sampled. The Rhode Island DOH donated 10 cartridges for us to use in our comparison tests. With 10 DNPH cartridges, we were able to test both accuracy and precision of our formaldehyde kit by collecting three samples in each of three different homes (plus a fourth sample in one home). We set up both instruments at approximately 3 ft above the floor on various pieces of furniture. Prior to going into the field, we calibrated each instrument to the appropriate flow rate, which was 300 mL/min for our Public Lab formaldehyde kit and 1L/min for the DOH assembly. In the homes, we set up the DNPH cartridge and Kitagawa tube in quick succession to minimize exposure to the air prior to official sampling. We simultaneously turned on the pump for each instrument and recorded the time. After either 30 minutes or 10 minutes, depending on the appearance of the Kitagawa tube, we turned off the pumps, capped and stored the DNPH cartridge, recorded the temperature and relative humidity, read the formaldehyde concentration on the Kitagawa tube, made the appropriate temperature corrections, and photographed the Kitagawa tube and its documentation sheet. All tubes and samples were stored in a cooler on ice. 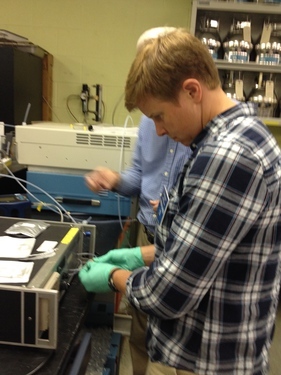 After the first round of samples (one using the Public Lab kit and a simultaneous one using the DOH instrument) were complete and recorded, we set up the second samples within 20 minutes, and third samples in similar fashion. We tested three homes with laminate flooring, where the age of the flooring ranged from 1 to 4+ years. The houses are listed as Site 1, Site 2, and Site 3; the sample rounds are listed as A, B, and C. At Site 2, sample A was above the maximum concentration detectable by the Public Lab kit, which is why that data point is not included in the graphs of the data below, and is listed simply as >95 ppb in the table below. At Site 1, all three samples were collected in a bedroom with a closed door. At Site 2, samples A, B, C were collected in an open living room and sample D was collected in an upstairs bedroom that was open to the atrium/living room. At Site 3, samples were collected in a large basement. Public Lab kit field blanks were also collected and were below the quantification limit. The data collected is listed in the table below. All concentrations are listed in parts per billion (ppb), which can be converted to μg/m3 by multiplying by the molecular mass and dividing by molar volume of the molecule (i.e. formaldehyde). Note that the column labeled “% Error” is the percent difference the Public Lab formaldehyde kit measurement is above the DOH cartridge measurement value for formaldehyde. The accuracy of the Public Lab formaldehyde kit measurements was not as good as we had hoped, with errors ranging from 20 to 70%. The highest errors (59-70%) were in a house where there was an abnormally high concentration of co-contaminants, but even when co-contaminants were in a more “reasonable” range, the Public Lab kit had errors from 21 to 46%. The reproducibility of measurements at any given site is quite good, however: the relative standard deviations were less than 7% at each site. This may indicate that the Public Lab formaldehyde kit could be useful as a qualitative tool monitoring formaldehyde concentration trends at a given site, with a given air chemistry (e.g. co-contaminant load). This bodes well for use alongside the formaldehyde plant-based remediation kit, to estimate the effectiveness of the remediation effort. Graphs of the data are below the table. 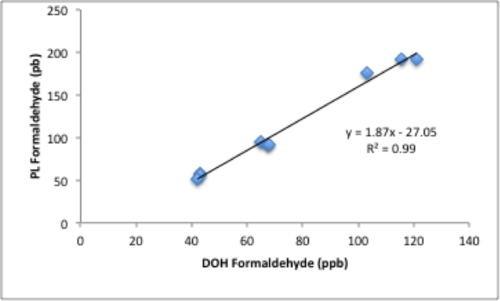 It appears as though there is a strong linear correlation (y = 1.87x - 27.05; R2 = 0.99) between the Public Lab formaldehyde measurement and the DOH formaldehyde measurement, even though the percent errors are high. Interestingly, there do not appear to be correlations between the % error and the concentration of acetone or acetaldehyde (or their sum). (1) Is this apparent correlation between the Public Lab and DOH formaldehyde measurements real, or due to an artificially weighted regression from the high (>100 ppb) formaldehyde concentrations? How many co-located samples would we need to build a robust empirical correlation? (2) Is it possible to quantify the effect of acetone or acetaldehyde on formaldehyde detection in the Kitagawa tube? Without distinct measurements of acetone or acetaldehyde, we would be setting up a situation with equal numbers of variables and unknowns, so the equation would have infinite solutions, but could we present basic ranges that would be realistic for each variable? (3) Are the % Errors perhaps correlated with the width of the Kitagawa tube opening, which is unique to each tube because we have to score and break it, so there is user error and variability. I’m going to borrow a caliper to measure the tube openings and will report back if there is a correlation. The flow rate did not appreciably change between tubes with different size openings though. (4) Where do we go from here? Can we use these tubes to gather quantitative data, or are we relegated to qualitative data (which can also be very useful)? We appreciate any and all thoughts and ideas! 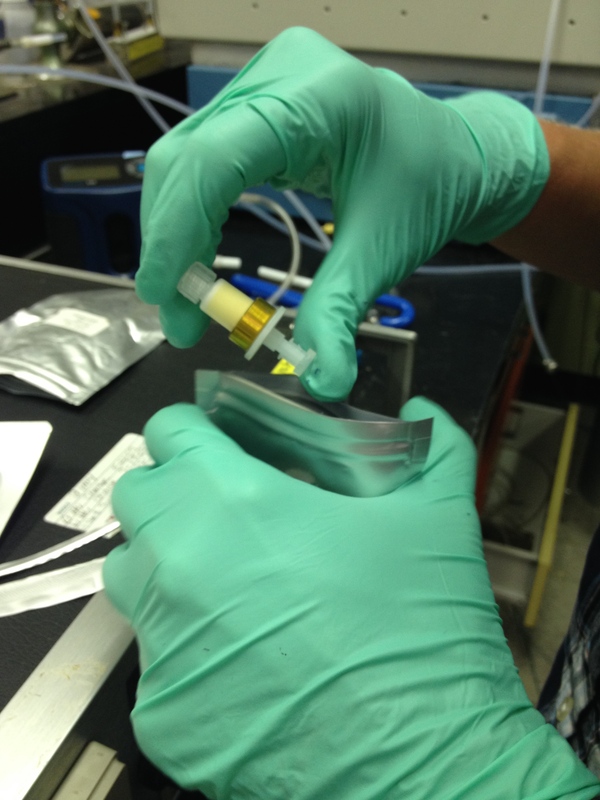 Here is a picture of the DNPH cartridge used in the DOH analysis, and one of Gretchen learning to use the DOH instrument. Hi, Gretchen - love the in-depth post. Was this potentially blog material too? Also, I'm happy to try to help with the images, it looks like there was an error but I can edit the post and re-insert them, which'd look nice on the blog. Shall I? Thanks, @warren, that would be great! I'll tag it for the blog too. Excellent precision in the values for both the public lab and DOH method--so there was clearly very diligent field work! Oooh -- nice find, @DavidMack! Thanks! @DavidMack wow, and that is even without interference from acetaldehyde & acetone etc? The article we developed our method from, http://www.ncbi.nlm.nih.gov/pubmed/23278296, found in laboratory settings "The slope of the line between the expected formaldehyde reading and the actual formaldehyde reading was 0.998 with a standard error of 0.158 (R2=0.930)." Just so this is recorded on this thread, here is my plan for moving forward: (1) Get information from the Kitagawa research team about co-contaminant tests they must have done during development of these tubes (note: thus far, my email probes have not been answered, but I will make a phone call today). (2) Try to expand our co-location study to at least n=30. I have contacted the North Carolina State Laboratory of Public Health, and am hoping to hear back from them soon. I plan to ask if they will be willing to provide us with the same generosity that the Rhode Island DOH/SHL folks did. (3) Do a literature search for more information regarding the performance of Kitagawa and Drager tubes. (4) Do a literature search for potential alternative low-cost formaldehyde detection methods. (5) If necessary, conduct chamber experiments with acetone, acetaldehyde, and perhaps other compounds like ammonia, ethyl acetate, and acetonitrile. Thanks @gretchengehrke for the update. Their lab evaluation using a formaldehyde generator correlated so well with the formaldehyde tubes I wonder if they tweaked the generator at some point to match the tube response and were only using the generator to show linearity and precision, which would be appropriate. In Balmat, they did a double blind test, where one person setup the generator and others took the samples. Another theory--and these are just theories--would be that the tube manufacturer uses a formaldehyde generator to set the tube reaction rate and this would explain why it worked so well in the lab. However, when you change the reference method, switching from a generator to TO11A as the known standard, you’re usually going to have different results. It’s not always so dramatic but volatile organic compounds are hard to capture. Do you know if there was a spiked lab sample included in this TO11A sampling plan? Sometimes the lab will put a known amount on a tube in the lab and send that along with the tubes used to collect the sample. The spiked tube is analyzed and that gives an indication of typical losses in capture. There is usually some loss in TO11A capture so that could account for some of the differences. Sometimes the lab just estimates, like 80% capture efficiency (e.g. take the raw results and divide by 0.80). If you wanted to keep exploring the method variances then setting up an apparatus with a formaldehyde generator and various test methods sampling from a manifold, might yield a better understanding of what is happening. Otherwise, I think the tubes still have value but your work seems to confirm that different detection methods will produce varying results. The value I see in your method is not so much for comparing to known regulatory standards--which there really aren’t that many (any?) in the ppb level anyway--but creating database of known exposures and then people can see for themselves how their situation compares to others. A comment was deleted due to violation of community code of conduct.